Speculation and rumors over the years has suggested Apple has worked on producing its own self-designed vehicle, sometimes referred to as an "Apple Car." So far, all of the rumors and reporting reference it being a car of some description, but there is the possibility it could be something else. According to multiple unnamed sources of Manager Magazin, prototypes of Apple's work have been seen painted in black and silver. While few details are provided by the publication about the vehicles, the main highlight is that vans are being tested, rather than cars. 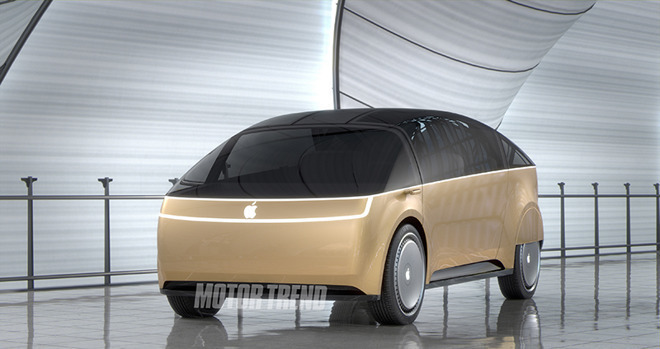 The report also claims Apple's engineers are now working on the interior of the vehicle. The "Apple Car," thought by some to be arriving between 2023 and 2025 at the earliest, has undergone development at Apple in a variety of different ways under the name "Project Titan." Originally working on an entire vehicle, the project changed its focus towards self-driving vehicle systems, though there are some signs it is shifting back towards overall vehicular design. One notable example of the revival is the hiring of Andrew Kim in December, a former senior designer for Tesla, which may have taken place as part of a wider attempt by Apple to poach Tesla employees. However, the "Project Titan" team recently suffered a blow, with more than 200 employees laid off from the autonomous vehicle group as part of a wider restructuring effort. In its current form, "Project Titan" consists of a testbed for autonomous driving on a fleet of 66 Lexus SUVs, roaming around the San Francisco Bay Area to perfect the sensors, computer systems, and software required for a vehicle to safely drive itself. Apple is also said to be applying some of Titan's technology into a self-driving shuttle program titled Palo Alto to Infinite Loop, or PAIL. The program is believed to be intended to ferry Apple employees between the Bay Area campuses, using specially modified Volkswagen vans.